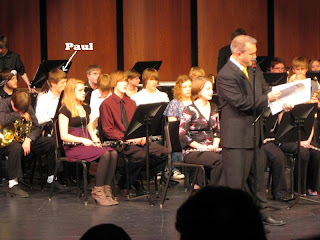 Paul had a band concert last night. Since it was his first concert in this band (the Wind Ensemble) I insisted on taking a picture. 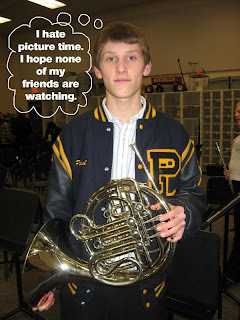 Here he is with his French horn and his thoughts. And here he is sitting in the band. It was odd not to have Katie there in the front row with the other flutes. The band played well and I could hear the horns (although not Paul individually) in every song. After dinner Paul went to his room to get dressed, and then came out and said he was ready to go. I had seen him ironing a button-up dress shirt and he had it on. But he was also wearing jeans. I did the "frowny-eyebrows" at him and said, "Don't you think you should be wearing dress pants?" "Uh, no. Isn't this ok?" "No. Katie always dressed up for concerts. Everyone did." So he went back into his room and got his dress pants off a hanger. He came out with them NOT on and said, "I'll bring them just in case." Which meant he didn't believe me. I conceded because I didn't want to yell. He would have enough time to change at the school if I was right (which I was). He did have to change. Then he went around the band room telling people he almost wore jeans for the concert. He got a few "YOU ALMOST DID WHAT???!!!" looks. Lesson for today: Listen to your mother. She might know what she is talking about. She might even save you from a bit of embarrassment. Can I laminate this post to keep for my girls when they are older because I'm almost positive I will have to convince them on a daily basis that "Mother is always right!" Poor Paul! Did he really think jeans would be appropriate for such an event? Did he never pay attention to ANY of Katie's events? You should have seen what Mike wanted to wear for an "interview" the other day--cargo pants and a Hawaiian shirt. Men, they just don't get it sometimes (or all the time). That's why they need women. Moms are almost always right and even if they are wrong they are still right. Right? Dads on the other hand are seldom right and even if they are right they are still wrong. Right? Morgan always gets so frustrated because I'm always right. She now wishes she would have heeded my urging to "fix" her hair in 6th and 7th grade. She sees the error in her ways!